Now you can choose a personal paper shredder that is as tough as it is stylish. The new Swingline EX12-05 Cross-cut Personal Paper Shredder features a large bin capacity for a personal shredder, allowing you to shred a wide variety of items. The EX12-05 saves you loads of your valuable time with the ability to shred your personal information inside unopened junk mail. The Swingline EX12-05 cross-cuts up to 14 sheets at a time and easily shreds CDs, staples, paper clips and credit cards. Swingline is new to the document shredder market, however will soon be known for manufacturing high quality shredders that can help protect your identity and comply with privacy laws. A generous manufacturer warranty is offered by Swingline, including a 2-year warranty on machine and 5-year warranty on cutters. Big and loud compared to some other desktop shredders. Perhaps it is not supposed to be a desktop. Shreds great though. I use it every day, however not heavy-duty use. Just does its job, no drama. I have a 25-sheet shredder in the next office, so I never "push it" with this one. Welcome to MyBinding video. This video looks at the EX 12-05, a cross-cut personal shredder by Swingline. Turn the machine on with the power switch on the back and the control panel on the front operates the auto forward. All materials go into the nine-inch wide slot on the top and the EX 12-05 takes it from there. This cross-cut shredder can handle up to 12 sheets of 20lb paper per shred as well as staples, paper clips, cards, credit cards, and CDs or DVDs. In the event of a paper jam, simply press the reverse button on the front, hold it down. The motors will back up and you can remove your project. All the shreds fall into a five-gallon waste bin below and CDs and DVDs are separated in their own container. The shreds are a level three security so you can rest assured. There it is. That's the EX12-05 by Swingline. For more demos, reviews, and how to's of this product and many more, check out MyBinding.com. The EX12-05 can be used to shred paper documents, CD's, and credit cards. The paper feed opening is 9" wide to accommodate letter- and legal-sized sheets. There's even another opening for CD's. When you're shredding paper, you'll be able to process up to 14 sheets at a time. It's a great solution if you need to dispose of various letters, bills, and so on. This is one of Swingline's eco-friendly shredders. It will turn off when you're not using it so that electricity isn't wasted. This feature also helps keep the motor in good shape so you don't have to worry about repairs. The EX12-05 can shred continuously for up to 4 minutes which should be just fine for personal use. There is a fairly lengthy cool-off time though, which is discussed in more detail in the next section. 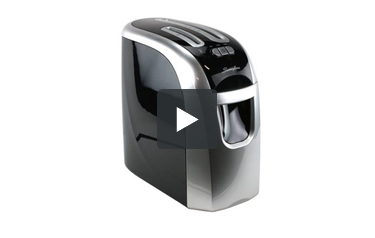 If you want a shredder that looks great, this is definitely one you should consider. It has an attractive black and silver color scheme, and the top is angled which makes it easy to use. It measures 16" (height) x 9" (width) x 17" (depth) and it can fair in fairly tight places. One particularly great thing about the EX12-05 is that its cutting mechanism is covered for a full 5 years. The other parts are covered for 2. The EX12-05 has a 5-gallon waste bin with a viewing window in it. (The window will help you gauge how many shreds are in the bin.) The size of the bin should be fine if you're the only one using this shredder. However, it might not be large enough if you need to share it with someone. This machine doesn't have any special anti-jam technology. You should be careful when feeding paper into it so you don't end up jamming it. Also, you need to oil this machine manually. There isn't an automatic oiler available for it. The EX12-05 needs 40 minutes to completely cool off after each continuous-duty cycle. This will be problematic if you need to shred constantly, so be sure to think about how much you'll really need to shred before buying this device. As you can tell by looking at the list of weaknesses, the Swingline EX12-05 isn't a perfect machine due to its small waste bin and the lack of an anti-jam features. However, its strengths make up for it, especially the automatic shut-off feature. All together, the EX12-05 is a good shredder, so make sure to check it out if you need something that can help protect you from identity theft.